When the economy is expanding and more people are working and earning more, they can afford to have more babies. But that time-tested connection between the economy and fertility seems to be broken. During the recovery that followed the 2008-2009 recession and continues today, the U.S. fertility rate has dropped quite a bit. 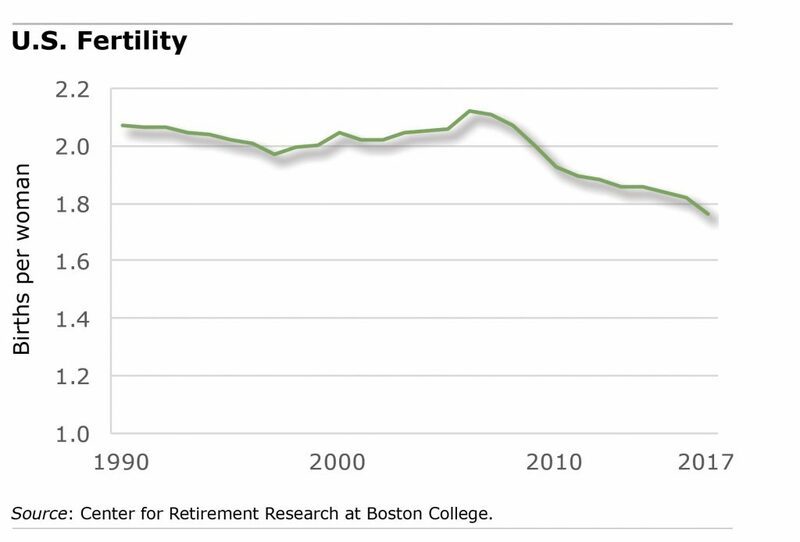 Lower fertility is of interest to retirement experts because it has serious implications for our aging population. AARP’s Public Policy Institute predicts a decline in the number of family members and friends available in the future to care for the elderly. Fewer babies also mean fewer workers will be paying into Social Security, in the absence of an increase in immigration. Of course, fertility rates in developed countries like the United States, Germany, and Japan are far below the post-World War II baby boom. But the very recent decline in this country is striking. The total fertility rate, the best measure of current fertility, is 1.76 births per woman. This is well below the rate of 2 births per woman a decade ago. This blog has spilled plenty of ink over the problem of so many workers having inadequate retirement savings. One theory is that they don’t understand the urgency. But a new survey makes clear that they not only are fully aware of the problem but are very worried about it. These chasers recognize that if they don’t make adjustments, it’ll be too late to repair their finances. Two out of three fear the worst: they’ll run out of money at some point in old age and will be forced to eke out a living on their Social Security checks alone.